Super R.B.I. 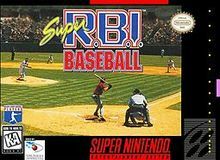 Baseball for Super Nintendo includes a full MLBPA license. Control nearly 700 real major league Baseball players from all 28 big rosters. There are several different gameplay modes.